The minimal yet professional design makes Bracketology Sports Tournament Bracket the perfect compliment or companion project to ANY sports graphics package! 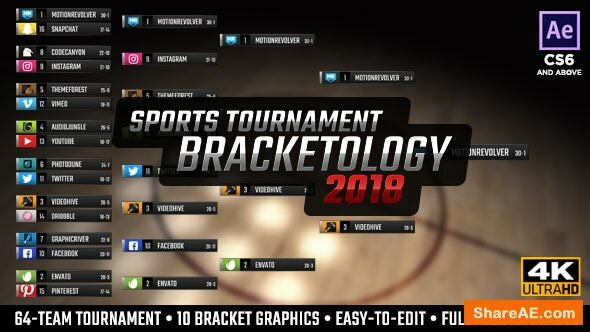 As with all MotionRevolver templates, Bracketology Sports Tournament Bracket comes with an in-depth video tutorial, walking you through the simple customization process. WHAT’S INCLUDED IN BRACKETOLOGY SPORTS TOURNAMENT BRACKET? The soundtrack and backgrounds from the preview video are not included, however, all files can be downloaded from the College Basketball Collection!